Is 'diabetic food' just a marketing ploy? Okra is fast gaining a reputation as a so-called 'superfood' for people with or at risk of diabetes or cancer. Commonly referred to as ladyfingers, or by its biological names Abelmoschus esculentus and Hibiscus esculentus, okra is known to have a positive effect on blood sugar control, among many other health benefits. 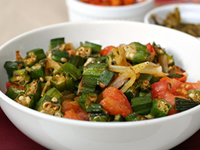 Okra is a tall-growing vegetable that traces its origin from ancient Ethiopia (Abyssinia) through to Eastern Mediterranean, India, the Americas and the Caribbean. Parts of the plant (immature okra pods) are widely used vegetables in tropical countries and are typically used for making soups, stews or as a fried/boiled vegetable. These tender pods are very low in calories, providing just 30 calories per 100 g, and contain no saturated fats or cholesterol. They are also rich in nutrients, completely non-toxic, and have no adverse side effects. How can it help treat diabetes? Evidence of okra having anti-diabetic properties has increased in recent years, with multiple Vitro (laboratory) and Vivo (animal) studies confirming okra as a potent blood glucose-lowering (or anti-diabetic) food. In one study, published 2011 in the Journal of Pharmacy & BioAllied Sciences, researchers in India found that diabetic mice fed dried and ground okra peels and seeds experienced a reduction in their blood glucose levels, while others showed a gradual decrease in blood glucose following regular feeding of okra extract for about ten days. Outside of scientific research, many people with diabetes have reported decreasing blood sugar levels after soaking cut-up okra pieces in water overnight and then drinking the juice in the morning, while in Turkey roasted okra seeds have been used as a traditional diabetes medicine for generations. The superior insoluble fibre contained in okra is believed to help stabilise blood glucose by slowing the rate at which sugar is absorbed from the intestinal tract. Because okra is a rich source of dietary fibre, important vitamins and minerals, and powerful antioxidants, the vegetable is known to be beneficial for health in a number of ways. If you are diagnosed with diabetes and on medication, check with your doctor that any natural remedies you plan on using are safe alongside prescription medicines (insulin, oral hypoglycemics, etc) before making any changes to your diet and/or treatment.